Last night I attended my first ever Minor league Baseball game with my church. 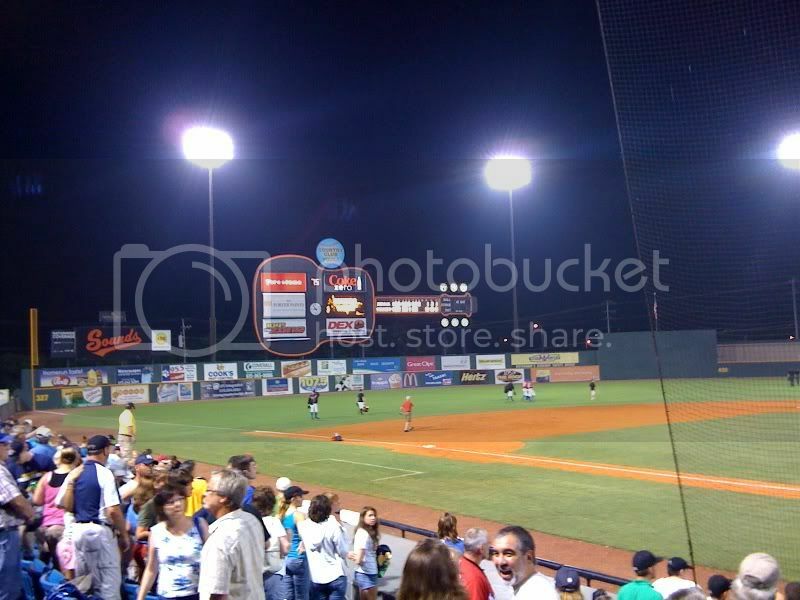 I went to Greer stadium in Nashville to see the (AAA) Sounds whip the New Orleans Zephyrs 10-1. Since it was my first ever minor league game I learned some things and I thought I would share. You want free stuff? Minor league ball is the way to go. Two members of our group got t-shirts (stuffed with coupons for McDoubles) and a third should have had a foul ball. There is only one problem with caring about things – the pain that comes when things don’t go how you wish they would. I have to say that I am somewhat ashamed about how I react when Kentucky loses in the NCAA tournament. It pretty much ruins my weekend. Oddly though, I prefer this feeling, being somewhat crushed by a loss, to the feeling I have had the last few years as a UK fan. When we lost in the first round of the NCAAs or the second round of the NIT it was expected. And rather than ruining my day, it was just one more loss. That is especially difficult when you consider the state of the program during my time at UK. Those years saw 2 national championships and 3 consecutive trips to the final. Last year’s NIT was painful. They program is back now. This year, UK should have won the tournament, but one bad game is all it takes. So I am crushed by a loss, but I am already looking forward to next season. I obviously have no idea what to expect from the football team but I feel that the basketball team is back where it belongs. And if it means more pain caused by a loss, I’ll take it. It’s a lot better than being numb. This is one of my favorite days of the year, I can hardly focus on anything other than the tourney. And this year UK is back in. Not only are they back in the tournament but they are a 1 seed. Anybody else suffer from the same amount of distraction as me? Also, who is your final 4? For today's blog post, I was going to write an open letter to NBC about their Olympic coverage. I would have talked about how unspeakably angry I would be if I lived on the West coast and had to wait 3 hours to see an event that is happening in my timezone. But that has been done already. I would have asked NBC if they have actually seen their website for the olympics. Because surely if they had they would be too ashamed of it and just take it down. I won't link to forums about that because of the trolls. But let's just say the internet has already got that covered. i think this Alyssa Milano twitter is about the website. I would have wondered aloud if they think we live in an age without the internet. I would have complained about all the figure skating coverage and the lack of Hockey. But that is just preference and I can deal with that. I cannot find an article about the volume of commercials so I'll just say this. Any non-live event has a volume of commercials that makes it not worth watching. I cannot tolerate 1 bobsled run, followed by 7 minutes of commercials followed by 1 bobsled run, followed by 6 minutes of commercials, followed by 1 interview, followed by 9 more minutes of commercials. It's simply unacceptable. Today is my favorite TV watching day of the year. I love the NCAA tournament, especially the first two rounds. I will be working some today but with digital cable and 4 games at a time most of the day, I'll be pretty distracted. Also I have read somewhere that the NCAA office pool is the most popular workplace game of all. With the advent of the internet it's easy to join many groups and play at multiple places. I assume that everyone is in at least 2 bracket pools. Now the age old question. Do you enter the same bracket (a sheet of integrity) into all your groups or do you play multiple brackets for multiple groups. If you are the sheet of integrity type, let us know your final 4 in the comments. This is mid-March. Normally this feels like a holiday to me. And even this year I feel like next Thursday should be a holiday. But It's a very different feeling March than I can ever remember. UK does not deserve to be in the NCAA tourney and I am simply a lot less excited than usual. The NASCAR season ended Sunday, and I wasn’t watching. Partly because the race started at 3 and I have church at 5, but also because I wasn’t really all that interested. I’ve been a NASCAR fan since probably the second grade. It is the first sport I remember caring about and the first major sporting event I ever attended was a Bush race at Bristol. Lately I have lost interest to some degree. I am only a fan, I’m not an insider and I don’t work in sports, but I do love NASCAR and I would like to see it improve. So here are some suggestions in the form of an open letter. I’ll start this letter by addressing the major problem with NASCAR. The season is too long. It begins in mid-February and it ended 11 days from Thanksgiving. That means that December and January are the only months without racing. This problem is not limited to NASCAR, it is a the problem with most professional sports, long seasons make for boring seasons. I’m especially talking to you MLB and NBA. Have any of you ever heard that absence makes the heart grow fonder, or to leave ‘em wanting more? I have put some thought into what can be done about this problem of the 10 month season. Here is my suggestion. I only want to improve things. NASCAR needs divisions. This actually solves 2 problems. 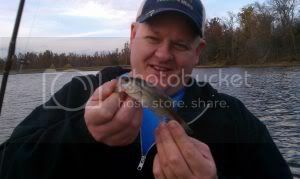 First, it shortens the season. Second, it makes use of some of the tracks that could use a second race (or a first, such as Nashville, Northern Kentucky, or Rockingham) Here’s how I propose it to work. Divide the drivers by the previous year’s standings with a snaking order. (1st place in div A, 2nd & 3rd in div B, 4th & 5th in div A, etc.) Then both divisions (Petty & Earnhardt?) have quality drivers and regardless which event you attend, you can see stars, just not all of them. Make that a 20 race schedule in the divisions, then put the top 6 from each division into the chase and the top 20 into the races for the chase. This gives NASCAR more television revenue, more tracks get to sell tickets, more fans have opportunity to see races, and the season ends nearly 2 months earlier. The only real problem I can think of with this plan is how to deal with the Brickyard or Daytona 500, but someone can figure it out. Maybe even in the comments. The second suggestion is to put a variety of track types into the chase. Maybe nobody has pointed this out. But a team that makes the chase and is particularly good at the mile-and-a-half quad-oval has a decided advantage. How about a Pocono or Bristol in the chase? If you are going to race stupid road courses, make one of them be in the chase. If weather concerns create the current schedule, take my first suggestion. If the season ended in late September you could race in Watkins Glen, or Pike’s Peak for that matter. But in mid November you are pretty much stuck with Phoenix and Homestead. If some other teams had a chance it would help as well. Of the 35 races this season, 30 were won by a Roush, Gibbs, or Hendrick team. If you went to divisions, and kept 35-40 teams per race, it would definitely give some other teams a chance to win some races. Mix in some minorities. NASCAR is no longer a sport of good ol’ boys from the south, but it is lily white. With the exception of Montoya, there is nothing resembling a minority anywhere around the track. I don’t know how to fix that problem, but seriously the future is in jeopardy as long as it remains the way it is. America is more diverse and will become more so. If golf can have a non-white superstar, surely something that’s actually fun like driving fast can as well. Don’t bow to the environmentalists…yet. The sound of a stock car is unmistakable, and if they switched to ethanol and sound whiny like Indy cars, it would lose some of the magic. (Maybe I’m showing my ignorance here, somebody can straighten me out in the comments. Feel free, as long as you can be respectful.) The day is coming when everyone will get around on some new fuel, but until then, let’s not have silent, hydrogen cars going around the track. I really like NASCAR and want to see it continue to be great. These suggestions are just my 2 cents to improve it. The outlook is not all bad I took this quiz and got 100% so the sponsors are definitely getting their exposure. Feel free to comment on this. I’d like to know my readers’ thoughts on this one. Do you think I’m way off base, or have better suggestions? I’ll start this letter by addressing the major problem with NASCAR. The season is too long. It begins in mid-February and it ended 11 days from Thanksgiving. That means that December and January are the only months without racing. This problem is not limited to NASCAR, it is a the problem with most professional sports, long seasons make for boring seasons. I’m especially talking to you MLB and NBA. Have any of you ever heard that absence makes the heart grow fonder, or to leave 'em wanting more? Feel free to comment on this. I'd like to know my readers' thoughts on this one. Do you think I'm way off base, or have better suggestions? This post will not make sense to you if you are not from Kentucky. But today I am genuinely sad about the death of a man I never met. If there was a Mount Rushmore of Kentucky basketball three of the faces would be settled. They would be Adolph Rupp, the second winningest coach of all time who put UK basketball on the map, Cawood Ledford the long-time voice of the Cats, and Bill Keightley the equipment manager since 1962. (If you want to suggest the fourth in the comments, feel free. I would vote for Dan Issel.) I am sincere when I say that I think everyone in the state knows who these three men are. Even my Granny would know them. So now all three of these men are gone. It is, sadly, the end of an era. Arguably the best program in the history of college basketball (certainly one of only 4 in the conversation) had always had this one commonality, Mr. Wildcat, Bill Keightley. Having just completed his 48th season on the UK sidelines, the Wildcats’ record over the past four decades with Keightley as equipment manager is 1,113-351. During his tenure, he served under six UK head coaches — Adolph Rupp, Joe B. Hall, Eddie Sutton, Rick Pitino, Orlando “Tubby” Smith and Billy Gillispie. 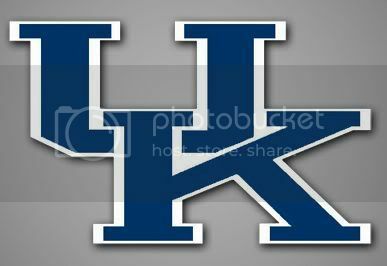 Kentucky, which has fielded 105 teams, has played 2,588; meaning Keightley played a role in 57 percent of those games. In 1997, UK honored Keightley with a retired jersey in his honor. He joins veteran broadcaster Cawood Ledford as the only non-player or coach to have a jersey retired at UK. Keightley was also among 88 Wildcat greats inducted into the charter class of the UK Athletics Hall of Fame in 2005. I thought this better than a silly April fool’s day post. And I wish it was a joke. Here's a video from four years ago. It is sad now. Basketball – I pull for the teams I like, rather than the teams that help my bracket. And there are a lot more teams I hate, than teams I like. I pull for the SEC even if it costs me in my predictions. I root against the ACC, Big 10, Big East, and Pac 10. There is a pecking order within those conferences though. I have no particular vitriol for Arizona St., or Wisconsin, for example. (I’m pretty neutral about the Big 12) I Loved watching Duke lose and would have loved to see UCLA lose. (Apparently Kevin Love is immune from moving screen, or any other, fouls.) I stand virtually no chance of winning any of my groups at this point, so I'm just watching for the enjoyment of it.